We are a partnership between the Florida Board of Education, the National Oceanic and Atmospheric Administration, and Florida’s citizens and governments. Our extension, education and outreach programs are done in partnership with UF/IFAS Extension and coastal counties of Florida. We tap into the research expertise of more than 800 coastal and ocean scientists at the state’s 16 major universities and research laboratories, and we are an integral part of the Institute of Food and Agricultural Sciences at the University of Florida, one of the nation’s leading Land Grant universities. Our 20 extension agents live and work in coastal communities. They have a breadth of experiences and tremendous trust from their local residents as reliable sources of science-based information. Our seven statewide extension specialists lead highly relevant programs including seafood safety, boating and waterway management, coastal conservation law, aquaculture and fisheries management. Florida Sea Grant envisions a future where people use our coastal and marine resources in ways that capture the economic and social benefits they offer, while preserving their quality and abundance for future generations. 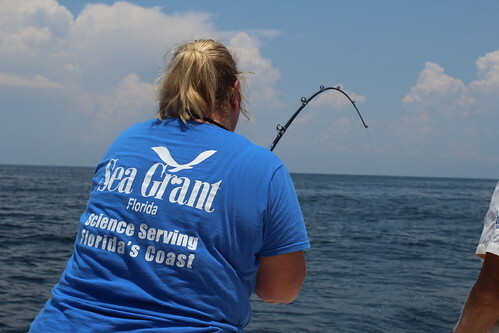 Florida Sea Grant’s mission is to support integrated research, education and extension to conserve coastal resources and enhance economic opportunities for the people of Florida. Your gift to Florida Sea Grant could strengthen our mission and directly support activities to preserve and sustain the precious ocean and coastal resources of Florida. Florida Sea Grant has a demonstrated record of success in designing the best possible solutions for ocean and coastal issues in Florida – combining research, outreach and education to address issues ranging from development of hurricane storm surge models that save human lives to tools that increase survival of catch-and-release fish. Florida Sea Grant strongly supports ocean education, from K-12 to the graduate school level. Leading experts in ocean science and coastal resource managers have received support from our program in their career development. Our faculty and staff work closely with coastal residents in a variety of non-traditional education and outreach programs that address their particular needs. The Director can work closely with you to identify exactly what you would like to accomplish with your donation, and the University of Florida Foundation can provide details on various options for providing gifts. If you’re interested in investing in Florida’s future, visit this link.